Ok now. I was browsing throught thw artbook searching for some good pics and i found this. I had idea of coloured copies of layers behind them and making some interesting background. I'm really bad with backgrounds -__-; I wanted to make it simple so i udes coloured gradient (green/ white, blue/white) and ended with this. I thought I could smash there some flowers but it didn't looked good so it stayed like this. 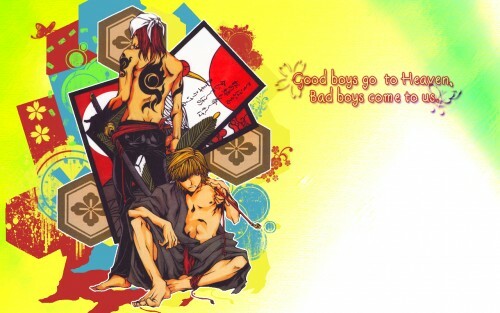 The motto: Good boys go to heaven, Bad boys come to us. Is from Amsterdam's: Good girls go to heaven, Bad girls go to Amsterdam. :D I hope the english is right. Effects used: Cloud, Gradient tool, Blend mode (Vivid Light), Ocean Ripple, Rough Pastels. the pic is from Salty Dog v, right? Could u submit more scan from it,plz ! Hmmm, another delicious wallpaper, Karisuto. The background is just a liiiiiitle too bright for my tastes, but it's not enough for me to not like it. Good work, again. Oh yeah, the English is correct. Great job!